Oxford Dictionaries defines social justice as “justice in terms of the distribution of wealth, opportunities and privileges within a society.” In honor of Dr. King, who fought for equal opportunities for so many, this week we have a short overview of how puppets have contributed and continue to contribute to the fight for social justice. 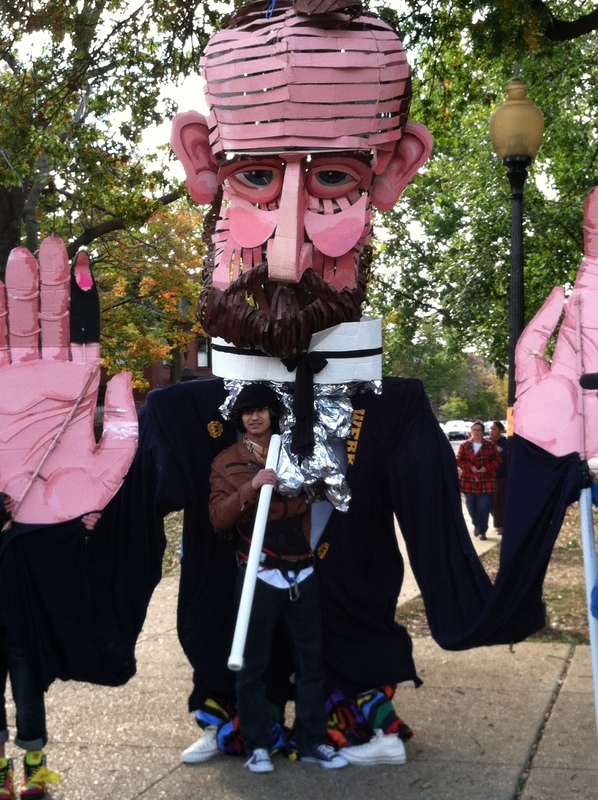 Giant puppet from the Million Puppet March in DC. November 2012. In his 1990 essay “The Radicality of the Puppet Theater,” Peter Schumann calls puppetry “…conceptual sculpture…uninvited by the powers-that-be.” Over the centuries, the low status of puppets in the art hierarchy has allowed them to be agitators for justice, the perfect mouthpiece for complaints about the government. Today puppets are used by theaters and activist groups across the US as an essential visual component of protests as well as a way to empower communities for fight for necessary change. While this is far from a complete picture (read this essay for more information), here is a short overview of the history of puppetry and protest. Puppetry has always been a transient art form. From medieval times through the nineteenth century, puppeteers moved from place to place, often performing outdoors rather than inside theaters. As Italian commedia characters such as Pulcinella travelled from country to country, these archetypal figures took on local characteristics and became distinct. However, whether they were named Kasperle (in Germany), Karagioz (in Turkey) or Punch (in England), all of these puppets entertained by breaking rules, upsetting authority and sometimes commenting on local issues and problems of the day. In early nineteenth century France, an out of work silk worker and dentist named Laurent Mourguet created the character Guignol, who became a voice for the working people of France disenfranchised by the combination of industrialization and economic depression. Later in the twentieth century, as protests multiplied in the 1960’s, puppets (especially giant ones) became a widespread part of the action. The most famous puppet theater associated with protest is probably Bread and Puppet Theater, located in Glover, Vermont and formed in 1963 by Peter Schumann. Originally based on the Lower East Side of New York City, Schumann began by creating shows about local problems and eventually moved on to deploring unchecked capitalism, the Vietnam War and other national issues. Bread and Puppet still takes their puppet and circus shows (always with live music) on tour each year and creates massive community circuses each summer at their farm in Vermont. Two other companies that provide puppet support to activists on a range of issues are the People’s Puppets of Occupy Wall Street, in New York City and Puppet Underground, in Washington DC. Run by volunteers, they hold workshops in puppet-making and create large and small scale puppets and artwork for protests. Over the years, several groups that began by working on protests and activism have started to also provide educational resources and community arts support in various cities around the country. Wise Fool Puppet Intervention began as an arts group adding visual impact to activist events in California, and artists with the group later founded Wise Fool New Mexico, which seeks to empower people through puppetry and circus arts. In Philadelphia, Spiral Q Puppet Theater provides arts programming to schools, support for communities trying to express a vision of change, and leadership training for young people. Across the country, puppets are still speaking for those with no voices; still part of a movement toward change for the better. This entry was posted in Inspiration, Soapbox, World and tagged Bread and Puppet Theater, Guignol, Martin Luther King Jr. Day, People's Puppets of Occupy Wall Street, Peter Schumann, Punch, puppet history, Puppet Underground, puppets and social justice, soapbox, Spiral Q, Wise Fool New Mexico, world by ccbooks. Bookmark the permalink.